HOW DOES A TACHYON CHAMBER WORK? How does a Tachyon Chamber work? Our specialists have been studying and working with energy for over 50+ years combined. The last 7 years specifically have been in-depth with the Tachyon fields. The energy within the Chamber has been carefully balanced and calculated, amplified, tested and retested for the greatest potency levels for full body/aura saturation. Our chamber works using our Proprietary Method of Michium technology which comprises the use and variance of different alloys, elements and crystals to emit the ​Tachyon Particles symbiotically in a very high powered state. These Chambers are constructed by Tachyon Living, a leading provider of Tachyon Products for Personal, Home and Office use. With our 7 layer approach, you will not find a stronger Tachyon Chamber anywhere. ​Our resident Oracle communicates with the 12th Dimensional Beings that watch over and anchor in the Tachyon Frequencies to each chamber, making sure every Chamber is running at peak performance. These Chambers, once activated, then continue to stream this portal energy into each Chamber no matter where it is located. 2. All walls are coated with Tachyon Particle Magic which creates a sacred space from the top and sides of the chamber. 3. 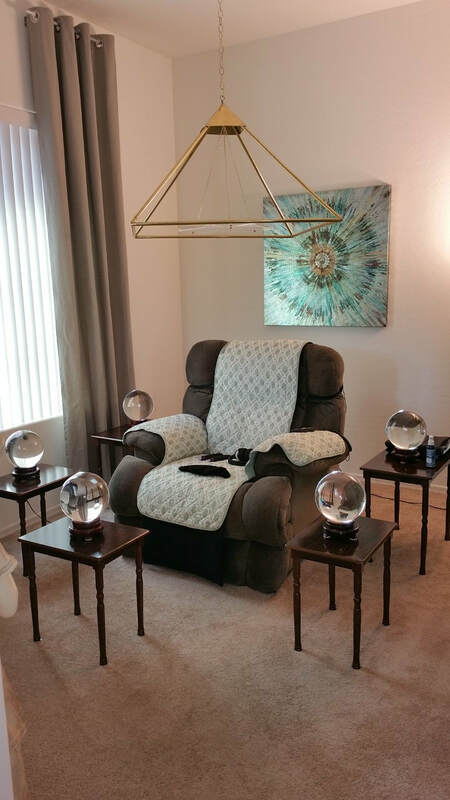 All draperies and recliner fabrics are permanently imbued with Tachyon Energy and our exclusive "Cloud 12" powered recliner allows each client to adjust their preferred position from sitting up to fully laying down flat. The Upper and Lower "Power Mats" are positioned just above and below each client flooding them with the highest amount of Tachyon Energy on Earth. These mats are underneath the recliner cover that is shown on the recliner. 4. You have 8 Mega Plates to choose where you'd like to place them. We suggest under the recliner, around the room, by the door or entry way or anyplace you'd like to use them in your home/office. ​and Tachyon Living Mega Rods to hold in your hands. 6. Soft engaging music plays to 528hz with variety of songs to choose from played through top noise cancelling headphones from Bose. 7. And the most important element of all...above you is our Tachyon Chamber Pyramid Centerpiece created out of a specialized alloy that holds Tachyon at it's greatest concentration, which also creates a Tachyon Portal to the 12th Dimension...directly streaming the Tachyon Energy into your entire body and down into the Earth's core and ley lines. The Crystal Tachyon Generator is magnified by the Sacred Geometry plate and crystals that lie within it. True quartz crystals line the generator making this the heart of your Powerful Tachyon Chamber Experience.